Demonstration model o a movin iron ammeter. As the current throu the coil increases, the plunger is drawn further intae the coil an the pynter deflects tae the richt. 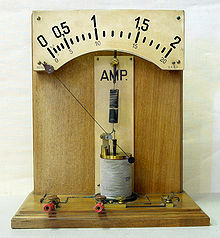 An ammeter is a measurin instrument uised tae measur the electric current in a circuit. Electric currents are measured in amperes (A), hence the name. Instruments uised tae measur smawer currents, in the milliampere or microampere range, are designtit as milliammeters or microammeters. Early ammeters wur laboratory instruments which relied on the Yird's magnetic field for operation. Bi the late 19t century, improved instruments wur designed which coud be moontit in ony poseetion an allaed accurate measurements in electric pouer seestems.